Everybody loves to capture their lovely moments as photo or video. These captured frames help them to laugh any happy in future time. Usually, we use our personal camera or photo studio take stunning pictures. How many of you know about the photo booth? Let me describe, what exactly it is. Photo studios are human controlled, and photo booths are self controlled, means automated. They are used to take funny photos automatically of you and your friends. There is a chamber containing a computer and a camera, and you can capture your own photo by paying money to it. Typically, photo booths require a standard credit card or cash to function. After payment, it shows a countdown timer for your preparation before taking a photo, and then it takes your picture with many visual effects as you want. Photo booths are usually found in shopping malls, airports and public places for a lot of fun. You can’t always go there to capture your funny pictures of paying. How it will be, if you take these advantages by sitting at home and by paying nothing. You can do it with your own computer by using the camera. Let’s know how to do it? Webcam Toy is a great online tool, which allows you to take extreme photo booth quality photos with your own computer and add more than 80 special effects right from the webcam. To start with Webcam toy, open any web browser from your computer and navigate to www.webcamtoy.com and click on Ready? Smile! Button. In the next screen, click on Use my camera! Button. It’ll ask for your permission to access the webcam on your computer. Allow it. Now you can choose from over eighty special effects and filter available on this website to give a stunning look for your face. After choosing your desired effect, click on the camera button to capture your image. The app will do a countdown from 3 to 1, and then your photo is ready with special effects. You can directly send that picture to Facebook, Twitter, Tumblr or Save it on your computer for later use. You may share this with your friends, family or can use it as a profile picture for a great look. 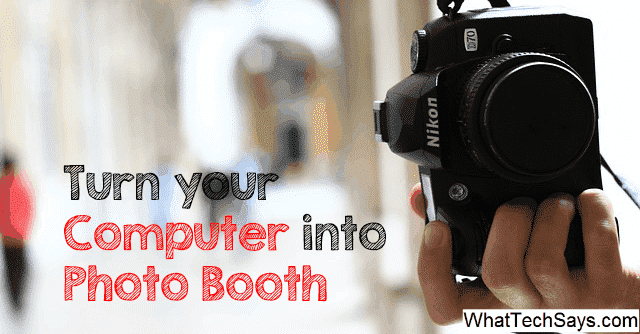 In this way, you can turn your computer into a diy photo booth online.